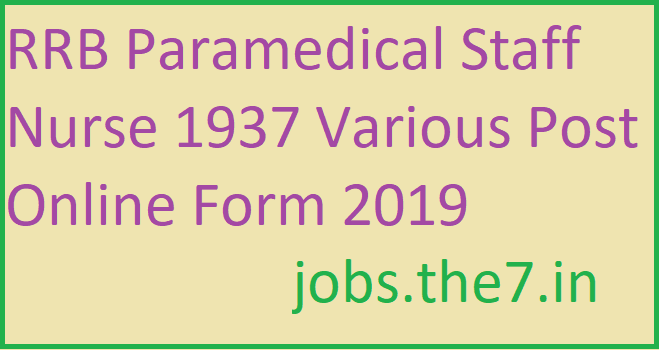 RRB Paramedical Staff Nurse 1937 Various Post Online Form 2019 - Government Jobs, Sarkari Naukri, Sarkari Result, Admissions, Rojgar, Exams Alerts. Payment will be made through Net Banking/Debit Card/Credit Card/SBI Challan/Computerized Post Office Challan. Staff Nurse- Candidates having General nursing & Midwifery with Certificate as registered Nurse/B.Sc nursing Degree will be eligible for this post. Rest All Posts- Candidates are suggested to read the official notification regarding Educational Qualification and related information before applying. 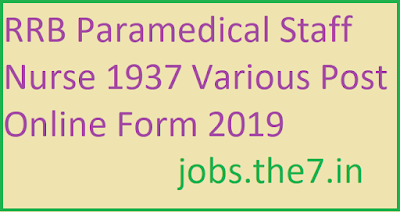 Candidates can apply through link provided below or they can also apply through official site of the RRB before 07/April/2019.